Today, the majority of congregations of the Evangelical Lutheran Church in America use the most recent book of worship, Evangelical Lutheran Worship, published by Augsburg Fortress, Minneapolis in 2006. Before that time, congregations mostly used the 1978 Lutheran Book of Worship. 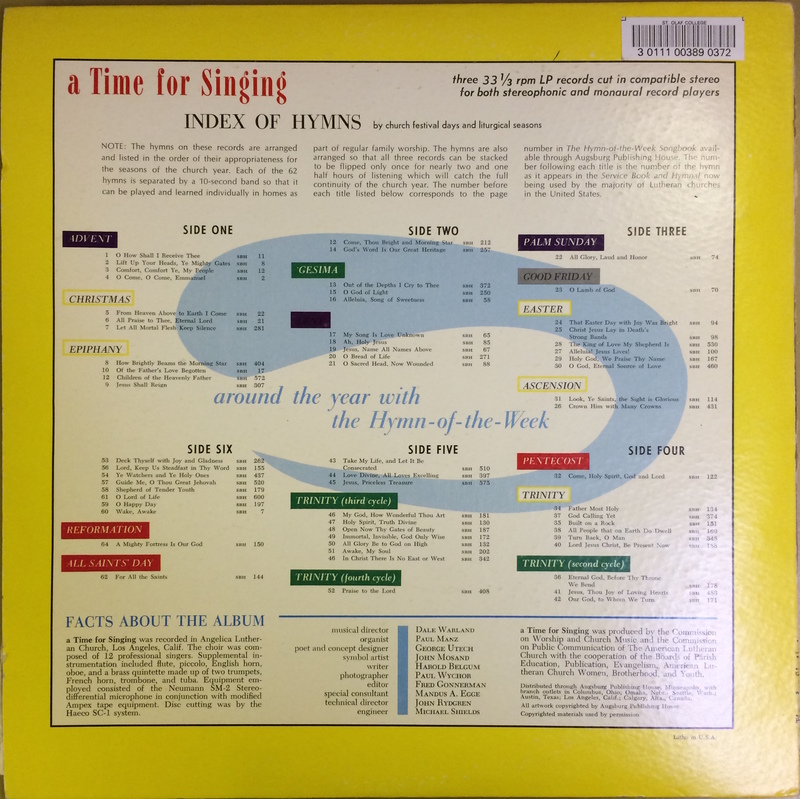 20 years prior to the release of LBW, the red Service Book and Hymnal was printed. In the year 1971, Dale Warland, most famously known for having conducted the Dale Warland Singers in St. Paul until 2004, and Paul Manz, well-known organist in the Minneapolis area, recruited a chamber choir, and small brass ensemble to record 62 hymns representing the entirety of the church year. 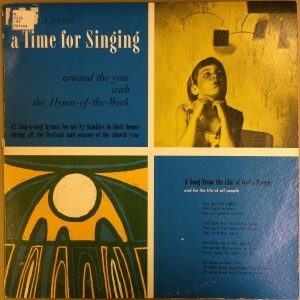 Recorded by Lutheran Records, it was distributed by Augsburg Publishing House in Minneapolis. As the subtitle suggests, this record was meant for families to play in their own homes as a way of learning hymns and worshipping at home. Between each track is a 10-second band of silence so as to find each track easily. 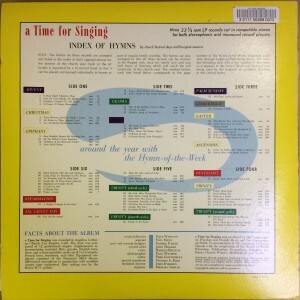 The back of the record sleeve indexes the hymns used to outline the church year. Next to each hymn, there are two numbers. One represents the page number where the hymn can be found in Augsburg’s The Hymn-of-the-Week Songbook. The second number, preceded by “SBH” represents the hymn number of its occurrence in the 1958 Service Book and Hymnal. The inclusion of these referential numbers makes these records an accessible teaching tool. Those families that want to teach their children about classic hymns, or those that want to worship in their own home, are able to locate each hymn with ease, both on the record, and in their songbook or book of worship. 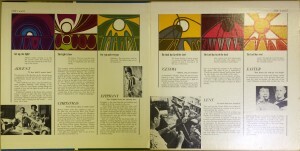 Within the record sleeve are paragraphs explaining each of the seasons and high feasts of the church year. These paragraphs give the listeners and worshippers a little context of how each hymn fits in with the corresponding season or feast. I think this is a very fun and effective way of introducing hymns to homes. Unlike many CDs today, this record is very interactive. Given the size of these LPs, there is plenty of jacket space to provide very useful and pertinent information. What makes it more musically appealing is the fact that the musicians are not your average church musicians or church choir. Paul Manz and Dale Warland have established themselves in the organist and choral worlds as being phenomenal musicians. There is no information about who the singers are, other than “12 professional singers,” but under the direction of Dale Warland, they are superb. As a Church Music major, this record makes me want to go out and purchase a turntable and listen to it all the time! The World’s Columbian Exposition, commonly known as the Chicago World’s Fair, of 1893 served as a turning point for America in many ways. The fair brought almost 1/3 of the country to see a Chicago reborn out of the ashes of the Great Fire of 1871, a shining White City representing the beautiful, though definitely idealized, America. As the world came to see the fair, many dignitaries and VIPs also visited. In his mid-70s, the orator and abolitionist Frederick Douglass was one of these VIPs. His visit to Chicago elicited a reception in his honor at the Quinn Chapel of the African Methodist Episcopal Church. The program welcomed men and women of all races to celebrate and honor the achievements of the Hon. Mr. Douglass by presenting on topics like “Why our ministers love him,” “From a business standpoint,” “The mothers of the race,” etc. Between the presentations and speeches (many notably by African American speakers), the assembly joined in the singing of songs and hymns. And longs to see the day. I can only imagine the power of that moment, races coming together to sing a message of unity and hope, praying for the future of love and friendship to come soon and free all from toil and pain. As modern-day musicians, we must remember that the ability of music to proclaim messages calling for social change makes it the responsibility of musicians to write about, compose, and trumpet messages like this one. Sometimes we need a reminder, for as Frederick Douglass, calling for the end of lynch law, said in his final remarks, “What [Americans] needed was a higher Christianity, one that is not ashamed of any of God’s children.” We still need that higher Christianity today. “The Douglass Reception: An Exceptional Affair in Many Respects–Something of the Programme and Certain Participants.” Cleveland Gazette. December 9, 1893. http://docs.newsbank.com/openurl?ctx_ver=z39.88-2004&rft_id=info:sid/iw.newsbank.com:EANX&rft_val_format=info:ofi/fmt:kev:mtx:ctx&rft_dat=12DB0E0CC3A99F40&svc_dat=HistArchive:ahnpdoc&req_dat=102FE1F6CA316FA2. 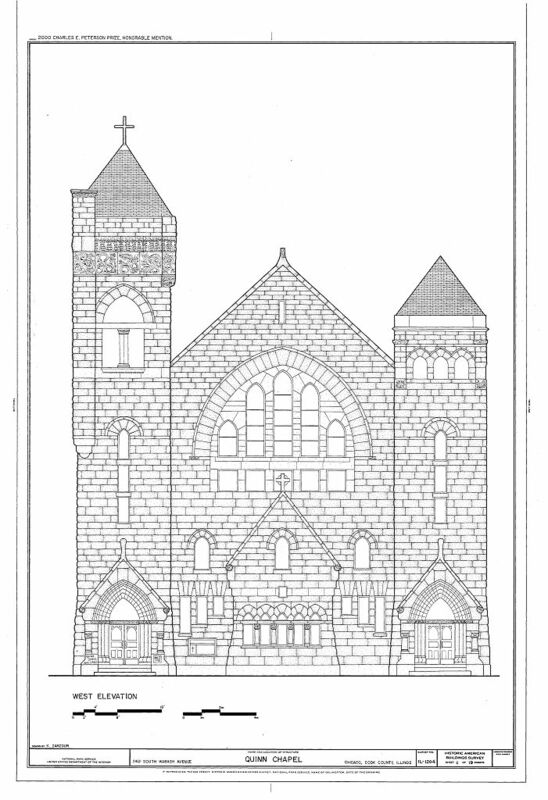 Quinn Chapel A.M.E. Church, 2401 South Wabash Avenue, Chicago, Cook County, IL. Library of Congress Prints and Photographs Online Catalog, http://www.loc.gov/pictures/item/il0843.sheet.00006a/ (accessed April 7, 2015).